The 2014 WOLA-Duke Book Award for Human Rights in Latin America is The Beast: Riding the Rails and Dodging Narcos on the Migrant Trail by Óscar Martí­nez. 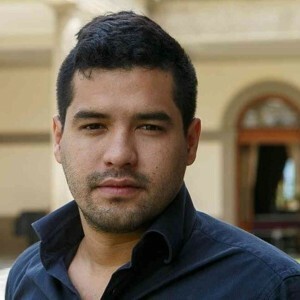 Martínez writes for Elfaro.net, an award-winning El Salvador-based investigative journalism site. The Beast chronicles the harrowing stories garnered from Martínez’s two years spent traveling up and down the migrant trail from Central America to the U.S.-Mexico border. Telling compelling stories with powerful prose, Martínez gives readers a rare glimpse into the horrors that millions of migrants experience on their journey to el Norte. Every day thousands of migrants are extorted, kidnapped, and raped as they migrate. This book has a timely message as Congress debates new legislation regarding border security and aid to Central America. Translated by Daniela Maria Ugaz and John Washington, The Beast provides an unflinching look into the lives of people who make the difficult decision to migrate. Martínez tells deeply personal stories, beginning with the real reason many choose to leave—violence in their home countries—and accompanies them through the dangers they risk while in transit. His book puts a human face on the current immigration debate and calls attention to the high levels of violence in Central America’s Northern Triangle of Honduras, El Salvador, and Guatemala. Named one of the best books of the year by the Economist, Mother Jones, and the Financial Times, The Beast has been hailed as a searing, revelatory, and impressive feat of reportage and storytelling. WOLA and Duke University are proud to honor Óscar Martínez with the 2014 WOLA-Duke Book Award. Started in 2008, the WOLA-Duke Human Rights Book Award is a joint venture of Duke University and WOLA. The award honors the best current, non-fiction book published in English on human rights, democracy, and social justice in contemporary Latin America. The books are evaluated by a panel of expert judges drawn from academia, journalism, and public policy circles. The award is given annually by WOLA and Duke University at an event in Washington, DC. The author of the winning book also gives a reading at Duke University in Durham, North Carolina and receives a $1,000 cash prize. An original, non-fiction book related to issues of human rights, the rule of law, social and/or economic justice, or democracy in contemporary Latin America. Books should pertain to events that took place in roughly the past 25 years. Books must be published the year before or year of their nomination. Scholarly and popular books are eligible. Edited anthologies are not eligible.